(APN) ATLANTA — On Monday, March 28, 2016, the U.S. Department of Health and Human Services (HHS) released a report showing that U.S. states choosing to expand Medicaid coverage, are providing much more comprehensive mental health and substance abuse coverage. 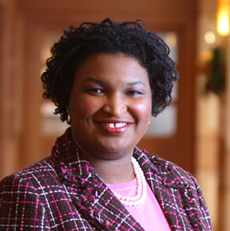 Georgia House Minority Leader Stacey Abrams (D-Atlanta) released a statement on Tuesday, March 31, 2016 praising the HHS report, and once again advocating for Georgia to accept the Medicaid expansion funds that were made available to U.S. states after the passage of the Affordable Care Act. Currently, 159,000 uninsured Georgians would benefit from mental health and substance abuse treatment programs that Medicaid expansion expansion funds would provide. These 159,000 people, or 25 percent of those who are uninsured in Georgia, are not receiving adequate care. “This week’s report is just another reminder that expanding Medicaid is the only path forward for Georgia,” Abrams said. “Today’s report shows that Medicaid expansion is an important step Georgia can take to address behavioral health needs, including serious mental illness and opioid and other substance use disorders,” HHS Secretary Sylvia Burwell said. Data has shown that States who have accepted the Medicaid expansion have had more available capital to utilize in other health sectors that would normally go without funding, HHS reports. President Barack Obama was in Atlanta on Tuesday, March 29, to discuss issues of substance abuse and addiction. It was here he once again made a call for Georgia to accept Medicaid expansion funds for adequate substance abuse treatment coverage. “Our task force, when we were looking at it, figured out that in about 85 percent of counties in America, there are just a handful or no mental health and drug treatment facilities that are easily accessible for the populations there,” President Obama said in his remarks, according to a copy obtained by Atlanta Progressive News. “So if you get a situation in which somebody is in pain… they may not have health insurance because maybe the Governor didn’t expand Medicaid like they should have… they go to a doctor one time… the doctor is prescribing painkillers, they run out, and it turns out it’s cheaper to get heroin on the street than it is to try to figure out how to refill that prescription, you’ve got a problem,” President Obama said. The President also emphasized that even though Georgia and a dwindling minority of other U.S. states have not yet accepted the funding, if Georgia were to accept now, the State would still receive three full years of Federal support. “We are proud to stand with the President as he continues to move our nation towards full and holistic access to medical coverage that can change lives,” Minority Leader Abrams said. To date, twenty states, including Georgia, have refused Medicaid expansion funding. The State of Louisiana became one of the most recent states to accept the funding when a Democratic Governor, Bel Edwards, was elected in 2015, to replace Republican Bobby Jindal. Gov. Nathan Deal has vehemently opposed expanding Medicaid during his terms in office, although some believed he would take advantage of the possibility of being granted additional flexibility in implementation, as other states have done. Not to be deterred, Democrats have continued to push for Medicaid expansion in Georgia. Since 2014, a total of at least 61 Moral Monday protesters have been arrested demanding Medicaid expansion at the Capitol, although no arrests took place this year. “Brain Disorders srike more than 9% of all ethnic groups across our planet”. 1 Thing about Ga is that the funding is low so low that we rank 42nd in terms of US dollars to fund buildings and staff to help people. People who have paid taxes, people who have resided in Georgia for sometimes 30 years. People who graduated from Roswell High, Redan, and others. These people are looking for any job, as wellas to get off the scourge of addiction and back into positive hobbies such as soccer, jewelry making, debating, horseriding aand others. ASk local employers to hire someone who needs medicine on a daily basis.THese diorders often strike in te late teens when kids are experimenting and sometimes make bad choices.Also we need a list of what services are available by county even when hospitals such as Rome and Thomasville are shuttered. 1 800. 950.6264 for national Organization on Mental Illnesses and Support Groups as well as list of medicine side effects according to Food and Drug Administration Maryland Office.